When I decide to explore a country by motorcycle, I usually search for a good motorcycle rental on the Internet and make a reservation. I then research the places I want to visit and plot a route on my GPS. After landing in the country I simply show up at the rental, pick up my motorcycle, strap my GPS to the handlebar and start my adventure. I’ve done this many times in the US, a couple of times in Europe and once in Sri Lanka. I had initially planned to do the same in Mongolia as well. But the more I researched the country, the more I realised that using a professional tour company would be a better idea instead of doing this on my own. The thing about Mongolia is most of the interesting stuff is not anywhere near a highway. You need to go off road and that’s where things start to get a little tricky. There are no signs anywhere and the tracks split often. They criss-cross across the landscape and if someone doesn’t like a track for some reason he goes ahead and makes his own since it’s just grasslands or desert everywhere. It’s basically a large web of tracks spread across small hills and large valleys. Very easy to get lost and go around in circles. 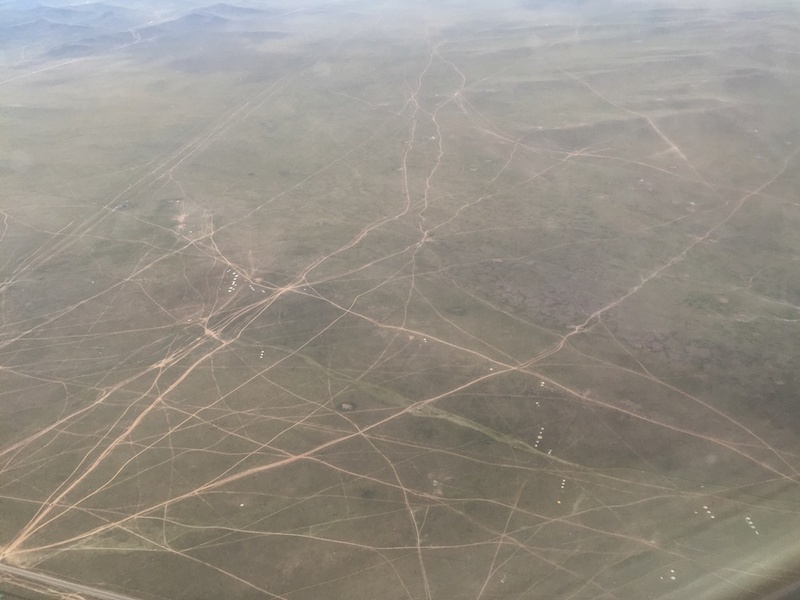 While my plane was getting ready to land in Ulaanbabtar, the capital of Mongolia, I peered out of the window and realized why Mongolians don’t feel the need for roads. They just go ahead and make their own. In fact, our lead rider, a Mongolian who has been riding these areas for decades, got lost a few times. He was in constant radio contact with the tour leader in one of the backup vehicles tailing us. The tour leader used his GPS and experience to correct the lead rider’s course a few times. If you want to stick to the highways then you don’t need to use a tour company. There aren’t many highways in Mongolia anyways. They all radiate out from the capital city Ulaanbataar and there is one that cuts across the country from east to west. 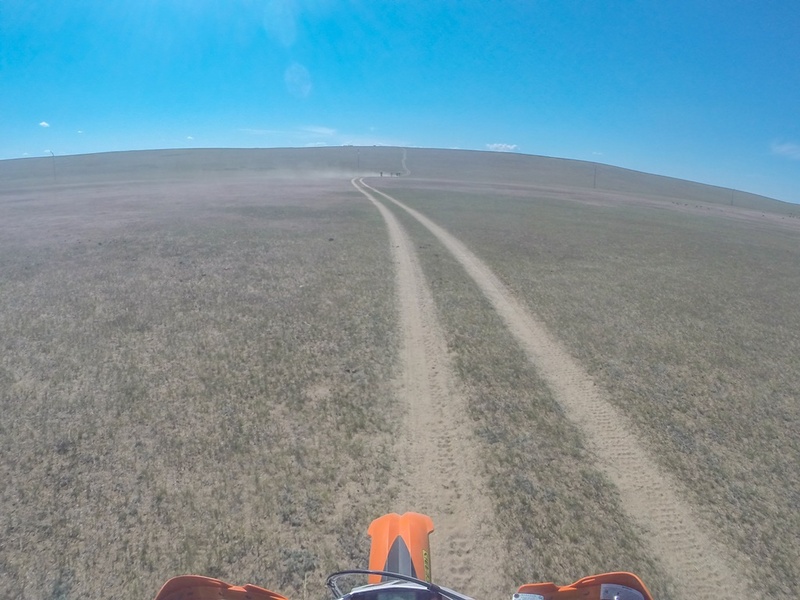 So if you want to say that you rode through Mongolia, it’s just a matter of starting at one end, pointing your headlight towards the other end and keeping the throttle twisted. No need for GPS. No need for directions. Just go straight. There are fuel stations at every major village along this highway and places to stay as well. 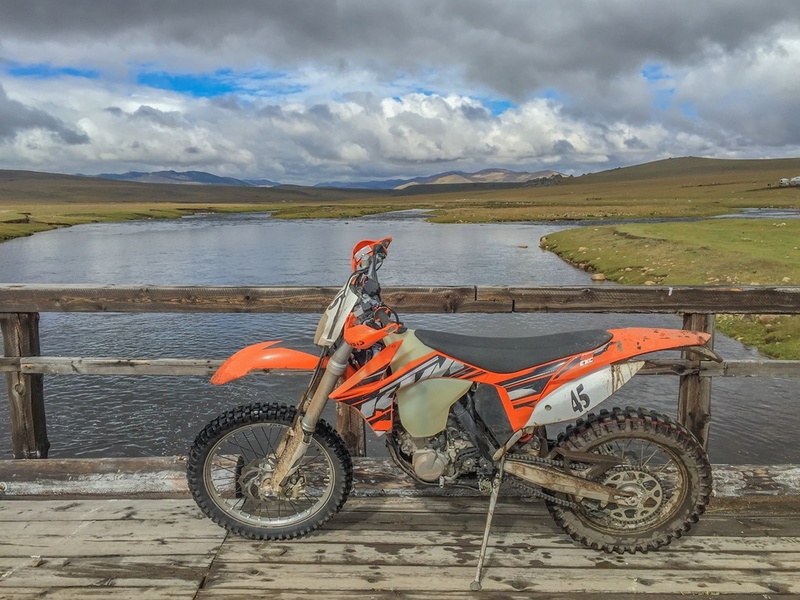 But I wanted to experience the real Mongolia and ride a dual sport motorcycle across the beautiful countryside. I had a limited amount of time and needed to spend it experiencing the country and its people instead of using sign language with nomads to get myself out of a lost situation multiple times a day. After some research I picked a company called Off The Map Tours and joined their tour to the Great White Lake and Khorgo Volcano. There were other tour operators, but none of them were offering the KTM 450 EXC, a motorcycle that I’ve dreamed of riding for a very long time. And what better place to do that than Mongolia. 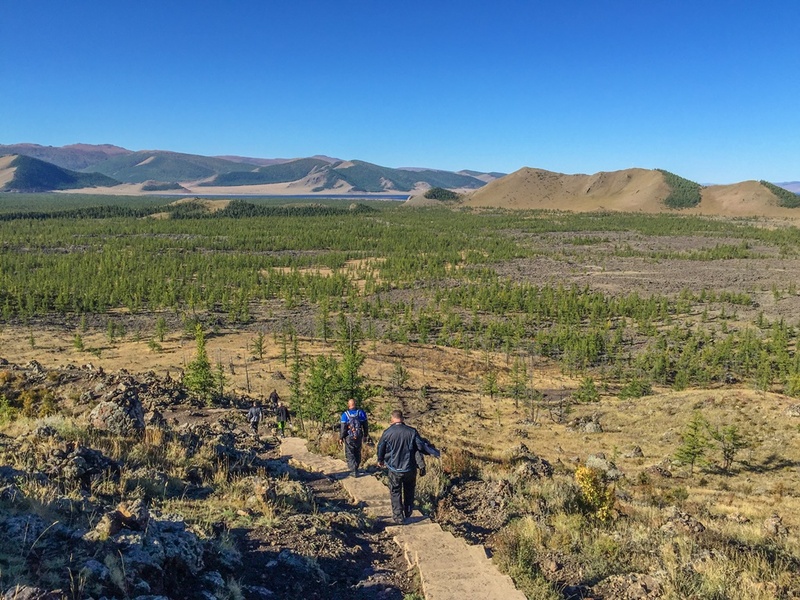 Mongolia has broadly three types of terrain. Towards the north there are mountains shared with Russia. The south has the Gobi desert shared with China. The middle portion is just steppes. A steppe is essentially a region that’s not wet enough to support trees and not dry enough to be called a desert. The only trees you see are on mountains and near water bodies like lakes and rivers. The rest of the land is mainly large flat valleys between these small mountains and hills. Even the mountains and hills don’t have cliffs, steep slopes and hair pin bends. To get across a pass between two hills you basically ride straight up and straight down. Let’s just say that the steppes of Mongolia are a difficult place to commit suicide by jumping off something. Which is why a gorge becomes a tourist attraction, and I have to assume, a lucrative suicide point as well. 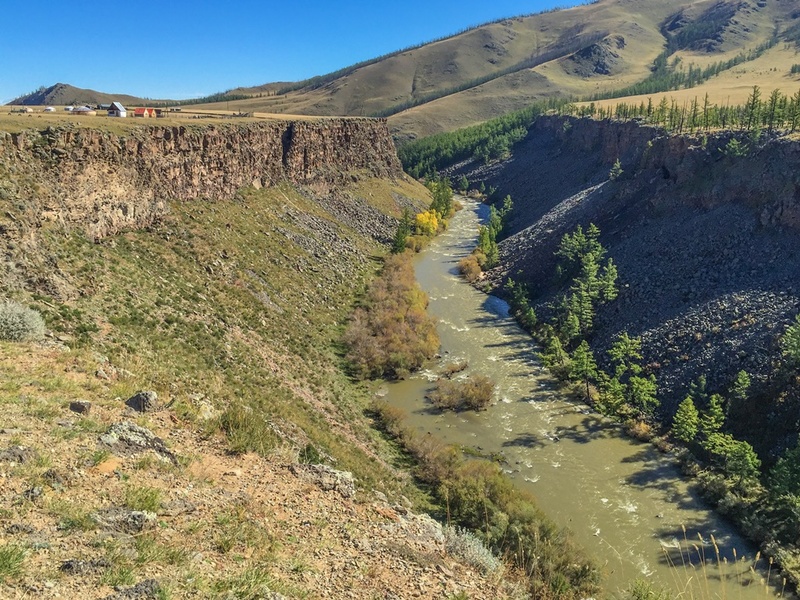 We stopped by at a gorge running along the only east-west highway of the country through which the Chuluut river flowed. I’m as serious as I can be when I say that after riding around the steppes of Mongolia for 1,750 kms in 7 days, this is the only place I believe a successful suicide could happen. In all other places you might just end up twisting an ankle or something. 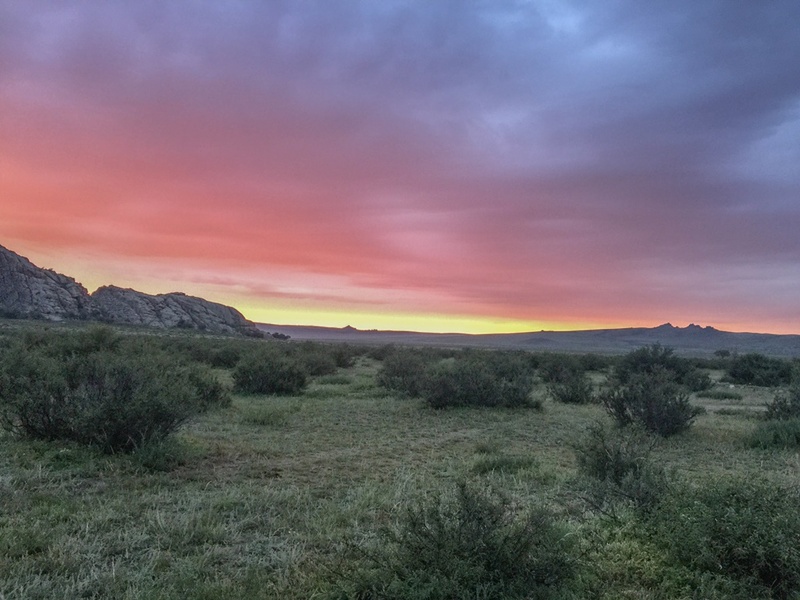 I had heard a lot about the amazing Mongolian sunrises, sunsets and clear night skies, which is why I didn’t want to stay in a hotel in a city. I’m not sure why it happens, but the breath-taking glow just before the sun rises and sets isn’t something I’ve seen anywhere else before. It feels as if a huge fire is heading your way and you just stand there speechless waiting for it to greet you. The night sky was something totally out of this world, in the most literal sense of the term. The magic starts after they switch off the generator at around midnight and there is pitch darkness everywhere accompanied by total pin drop silence. You need to brave the cold and step out of your warm ger to look up and see the sky completely filled with stars. Not a single patch of darkness. You can actually see clouds of stars, not solitary one of groups like you normally do. Out in the grasslands far away from the cities there is zero pollution and no man made light emanating from the surface of the earth. The air is as pure as it can ever be and every breath you take infuses new life into you. Which is why you can see the stars so clearly. I’m not a star gazer. But even I was spell bound by what I saw. A truly surreal experience. There is a huge difference between visiting a country and experiencing it. One lifetime isn’t enough to experience this beautiful planet in its entirety. But I’m trying to squeeze in as much as I can. 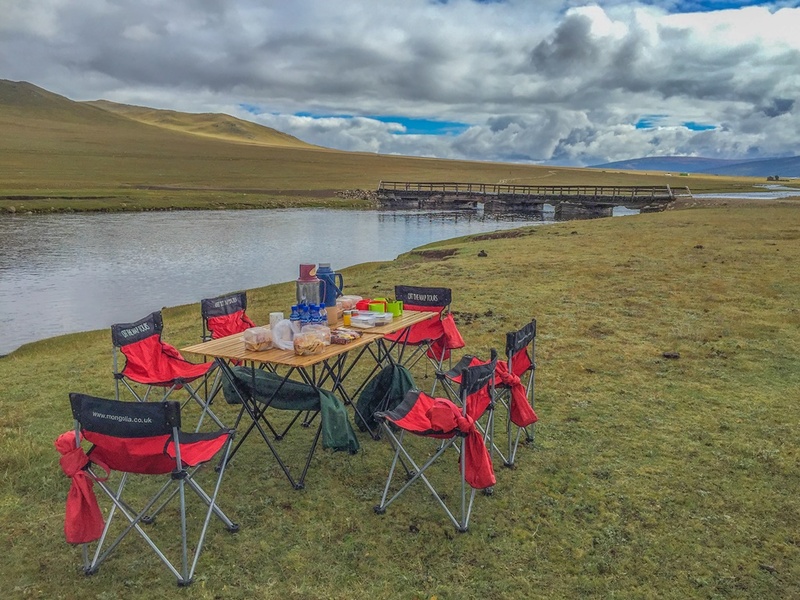 On the first day of the ride we stopped for lunch at a vast open grassland. As we were having our meal a shirtless man rode his motorcycle towards us to check us out. He had a little girl sitting on the tank of the motorcycle. He was a shepherd minding his herd nearby and was curious to see bright orange motorcycles stop in the distance. The girl had a perplexed look on her face and I wasn’t sure if that was how she looked or it was our presence that perplexed her. We tried to talk to her but she just gave us that perplexed look. We gave her some of the chocolate snacks that we had carried to munch on during rest breaks. She took the snacks stilling looking perplexed. Finally as the man started his motorcycle to go back to his herd, she raised her hand and waved it at us slightly. And then her perplexed face broke into the most amazing smile. She melted our hearts. What a cutie. We know him as Genghis Khan. But the name he assumed when he united all the tribes of Mongolia was Chinggis Khan. 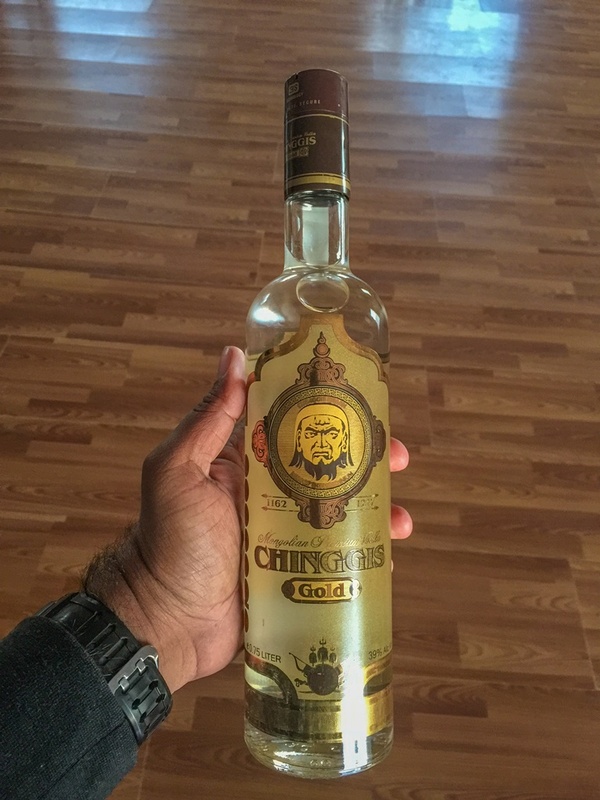 There is a Mongolian vodka by that name and there are two problems with it. Firstly it’s bloody power packed. One large peg will settle you pretty good. Secondly, the Mongolians use a large glass mug for a peg measure. When I asked for a large peg one evening at the restaurant of our ger camp, I was handed a glass that was pretty close to full. The next morning I woke up with my head spinning. It was supposed to be a long off road stretch that day. So I popped a Crocin which straightened my head out. Otherwise I’m pretty sure I would have crashed out before I reached too far from the ger camp that morning. I strongly suspect that the Mongolians use that peg measure mug for their horses as well. That peg size is more for a horse than a human. It is quite common to see cairns at high points in Mongolia. They can be at the peak of a hill or mountain or at the crest of a pass. 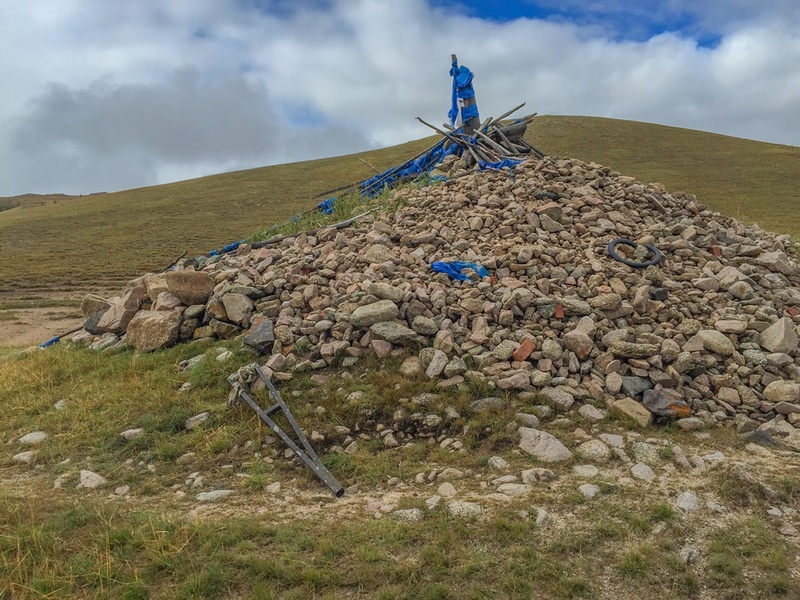 A cairn is basically a pile of stones with a few sticks standing out in the centre with coloured prayer flags adorning the structure. They are considered holy and some Mongolians honk thrice when passing them. It’s a way of thanking God for getting them up to that point. If they are on foot it’s customary for them to walk around the cairn, pick up a stone and throw it onto the pile while saying a short prayer. People also leave stuff at cairns. I saw a crutch at the base of a cairn. Most probably the owner had met with an accident and used the crutch for a while. After getting cured he must have walked up to this cairn, left the crutch there and prayed for something like that to never happen again to him. 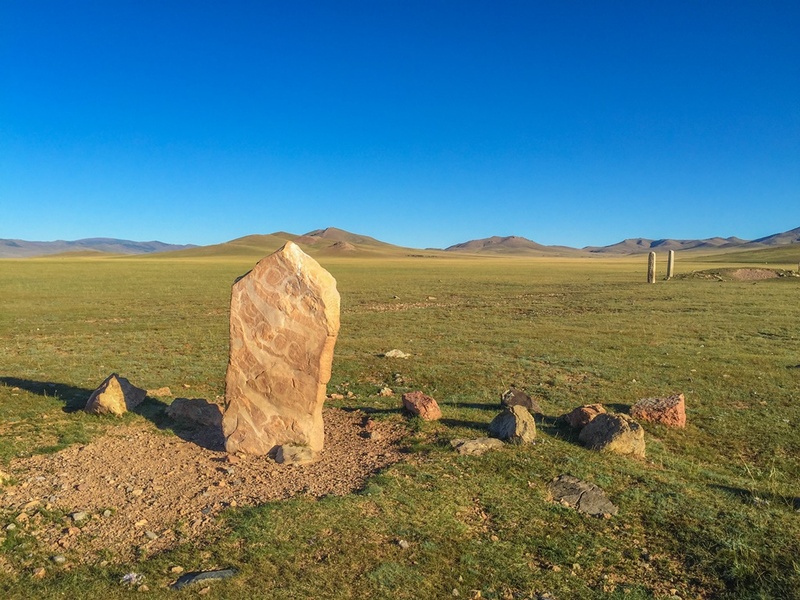 We came across Deer Stones while riding our motorcycles through the interiors of Mongolia. They are believed to be an astounding 3000 years old and it’s amazing that they have survived all these years in this harsh environment. The Bronze Age nomads believed that after their death deer would take their souls up to heaven and that’s what depicted in the carvings on these stones. There was nothing and nobody close by. I would think that something 3000 years old and as small as this would be cordoned off and guarded. But these stones just lay there in the middle of nowhere, instead of being cared for in a museum. In a way I’m glad these stones were where we found them and not in a museum. It make this part of the ride even more special. However we did use this interruption in our ride as a pee break. And no, we didn’t piss on the 3000 year old deer stones. During this time of the year in Mongolia the sun sets at around 9 pm. Dinner used to be served at 7:30 pm and thereafter we used to gather around and share our riding stories while sipping on Mongolian vodka or beer. 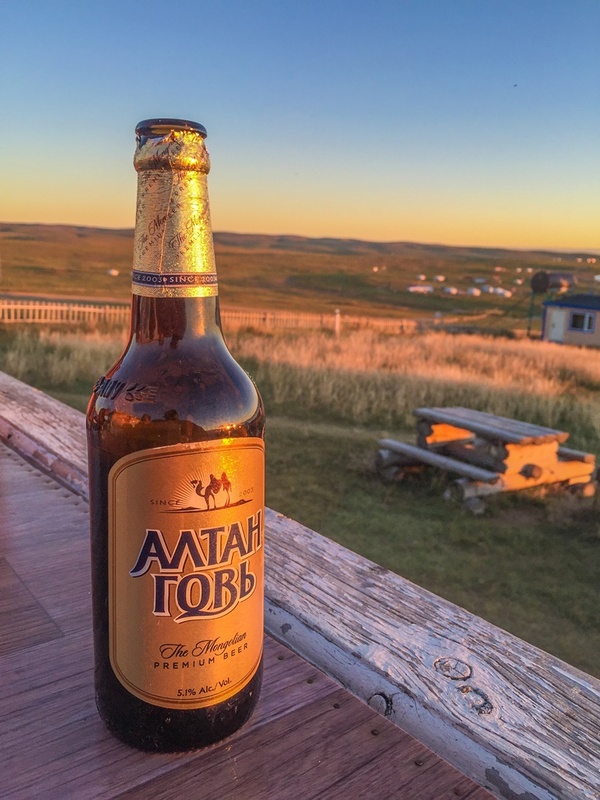 My beer of choice was the Golden Gobi, brewed in the capital Ulaanbataar and named after the Gobi desert in the south of the country. The golden sunsets were a heavenly match for the pints of Golden Gobi. One of the most memorable moments of the ride was the lunch we had by a wooden bridge on the bank of a small river. We had been following the river for a couple of hours as it meandered through the grasslands. The sun kept playing hide and seek with us. It was a perfect day to ride a motorcycle off road. This day is etched in my memory forever. And just in case I forget what this day felt like, I’ve decided to keep the GoPro footage of the entire day. During the briefing the tour leader had warned us that the first day would be a long hard day of riding. We rode a total of 400 kms that day, out of which 300 kms were flat grasslands. Although we could ride faster the lead rider restricted us 70 kmph. 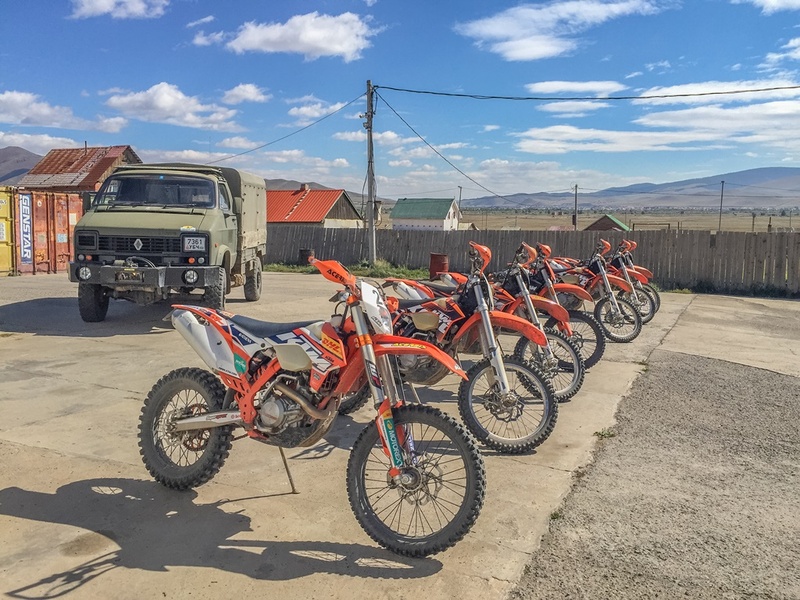 There was a very important reason for doing so and its something you need to keep in mind when riding through the steppes of Mongolia. For the most part the tracks are straight and curve gently. So you can keep the throttle twisted and go flat out if you want. But the problem is that tracks intersect each other at all kinds of angles. If you are going fast it’s too late to brake and slow down before your front tyre rams into the deep corrugations of the intersecting track. Braking on loose gravel and sand isn’t going to be very effective anyways. It’s better if the tracks intersect at 90 degrees. You get just enough time to stand up, put a death grip on the handlebar and brace for impact. But when the tracks intersect at angle other than 90 degrees the handlebar turns as it hits each corrugation and you really need to turn it back and keep it pointing straight. It you don’t you and the motorcycle are going to fly off in different directions. This is also why you need a motorcycle that is suited for this terrain if you want to cover long distances in a day on these steppes. In all the seven days, I hammered the front of the KTM 450 EXC many times into corrugations at all kinds of speeds. But the front suspension didn’t bottom out even once. The long travel of the front shock absorbers is just what this terrain needs. The Khorgo volcano is an extinct volcano last known to have erupted 8,000 years ago. It sits close to the Great White Lake and on our way back we went to see it. We rode our motorcycles up the rocky sides of the mountain and then had to walk up to the 200 meter wide mouth. We had to walk up quite a distance. Thankfully towards the top there were steps to help us. Climbing up a mountain armed to the teeth with riding gear and heavy adventure riding boots wasn’t funny. It was hard work but in the end it was worth the effort. The view from the top was absolutely breath taking. 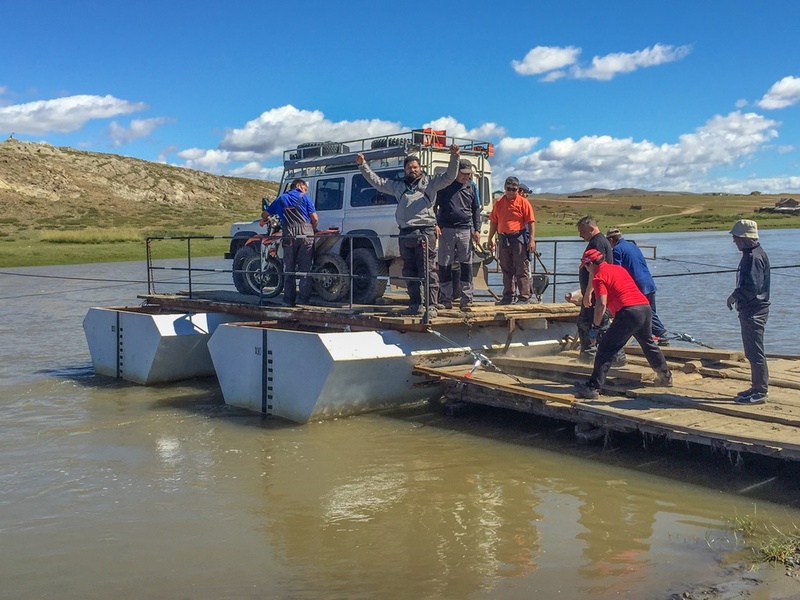 The river crossing by raft was definitely one of the more exciting moments of my ride around Mongolia. Rolling our light motorcycles on and off the raft was easy. But getting the three heavy backup vehicles onto the raft and off it was pretty scary, at least to me. But for the Mongolian operating the raft it seemed like it was business as usual. Then it struck me. Half the population of this country doesn’t have an address. They are nomads and move two to three times every summer and stay put every winter. They can move anywhere in the central grasslands of the country. So if any telecom service provider offered services to just the cities and major towns, it meant it was ignoring half the addressable market. 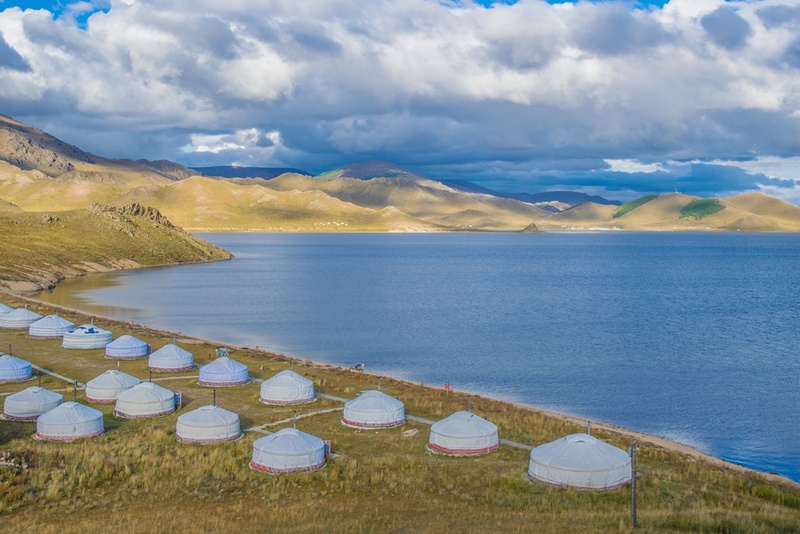 That’s why Mobicom, the service provide I was using, figured out a way to connect the entire grasslands of Mongolia with not just basic cellular service, but also high speed internet. 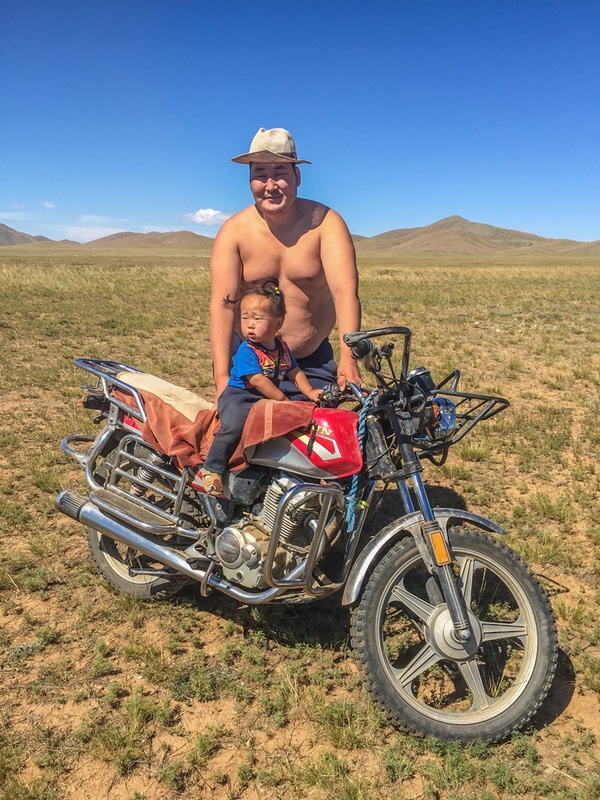 My preconceived notions of Mongolia were shredded to bits.